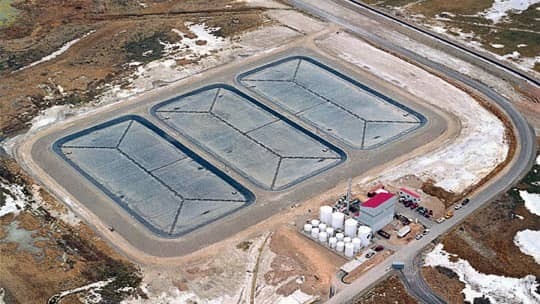 Salt Lake City Airport uses XR-5 floating covers to contain deicing fluid, protecting surrounding rivers and streams. Location: Salt Lake City, UT U.S.A. Faced with the need to effectively contain deicing fluids, with particular sensitivity to their potential effect on rivers and streams, experts overseeing improvements to Salt Lake City International Airport selected XR-5® geomembrane by Seaman Corporation because of its proven performance record. The need to contain the pollution threat was heightened because, at the time, the city was immersed in infrastructure improvements in connection with the 2002 Winter Olympics. Increased air travel was expected to increase deicing activity at the airport, meaning a heightened need to control runoff, especially since a primary component of the deicing fluid is propylene glycol, a potential hazard to streams and rivers. CH2M Hill Engineers, the consultant for the project, worked with the airport to design and build three holding cells, each two and a half acres in size. Once completed, each impoundment would have to contain 3.4 million gallons of deicing fluid. XR-5 geomembrane was specifically chosen for the liner, not only because of its long-term track record, but also its "A"rating with both ethylene and propylene glycol and jet fuel. An XR-5 floating cover system was created for the three impoundments to eliminate the threat of odor, waterfowl kills and dilution from rain water. The floating cover design incorporates a rain water collection system, an active pumping and discharge piping system, and maintenance walkways and access hatches. Lange Containment Systems prefabricated large XR-5 panels and utilized shop-customized components to complete the lining and floating cover system installation on schedule, creating an economical storage system that will protect the surrounding environment for many years to come.